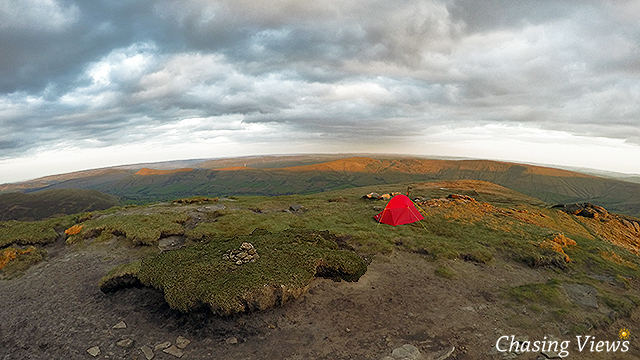 Well, my first impression of wild camping on Kinder Scout is WOW! 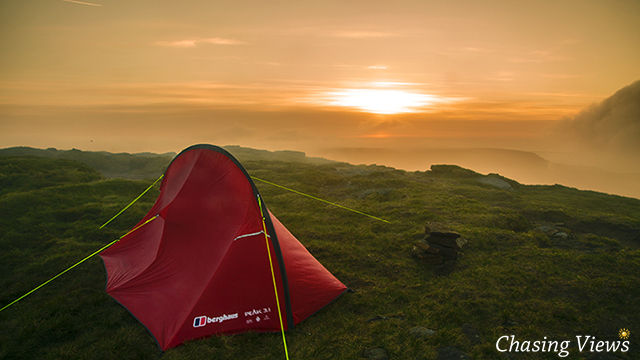 What an excellent spot for a wild camp in the Peak District, the views were mesmerising. I had been looking forward to this mission for quite some time. It’s over 20 years ago since I last went trekking on Kinder Scout plateau. The day before my trek up Kinder, I couldn’t stop checking the weather, hoping it wasn’t going to spoil my plan. It was looking good, the weather forecast was ideal. Sunny with breaking cloud during the day, and a clear sky during the night. Awesome! 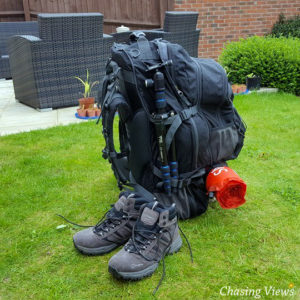 I had purchased a new backpack (Hi Gear Long Haul Travel Pack 80+15L) especially for this mission as I had to carry camping equipment and food, as well as my usual camera equipment. So, the day for wild camping on Kinder Scout had arrived. I awoke to a beautiful morning in Nottingham, lovely blue sky with a warm feeling in the air. 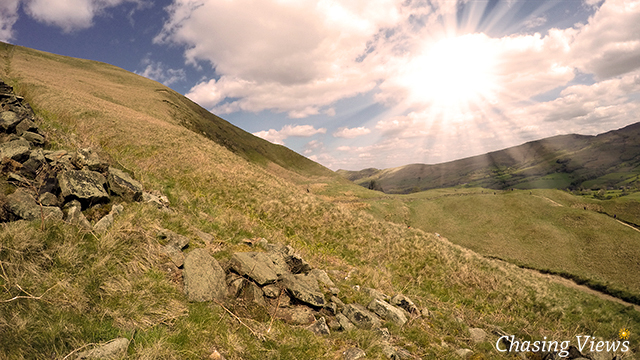 After grabbing myself a few cups of strong coffee, it was time to head off to Edale in the Peak District. There are a number of routes from Nottingham to Edale, but as I live in South Nottinghamshire, I decided to head off along the A50, A515 through Ashbourne to Buxton, then onto the A6 through Dove Holes, and eventually turning onto the A623 to Sparrowpit. 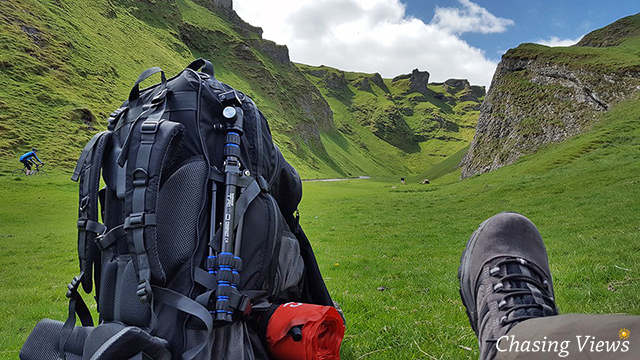 I decided to take this route so I could take in the views of Winnats Pass. A very tight road that is carved into some breath-taking scenery. As the weather was so good, I decided to drive through Winnats Pass and park at Speedwell Cavern to enjoy a nice hot drink and a sarnie (slang for sandwich). After enjoying my coffee break and taking in the fantastic views of Winnats Pass, I jumped back in my car and headed towards Edale Train Station as it allowed overnight parking for £6, and it was an ideal location to start my walk up Kinder Scout. Grid ref: SK 08484 87560 After walking a short distance, I came across the much documented Old Nags Head pub. It would have been rude not to “nip in” for a swift pint of their best cider. Although it was the first time that I have stood at a bar with a 19.5kg backpack on my back, I found the pub to be nice and friendly, I got a warm welcome from the bar staff, and I thoroughly enjoyed my pint. Now the light refreshments were out the way, it was time to start my trek up Kinder Scout. Although there are quite a few different routes up Kinder Scout, I had already opted to commence my walk from the official start of The Pennine Way which was literally a stones throw away from the pub I had just left. The official start of The Pennine Way. After following the Pennine Way for a few miles, gradually working my way up to the final push, I was greated with one very steep climb which I knew would lead me onto Kinder Scout Plataeu. Although there were signs that others had taken this route, it didn’t come across to me as being a well trodden path, probably due to how steep it was. I knew it wasn’t going to be an easy route, especially with 19.5kg on my back. I decided to take a 10 minute rest, rehydrate myself, and take in the fantastic views of Edale. After enjoying a short rest, I was in the right frame of mind to take on this route! As you can see from the image, it’s not what I’d call a leisurely stroll. I was barely a quarter of the way up before I really started to notice the full weight of my backpack. 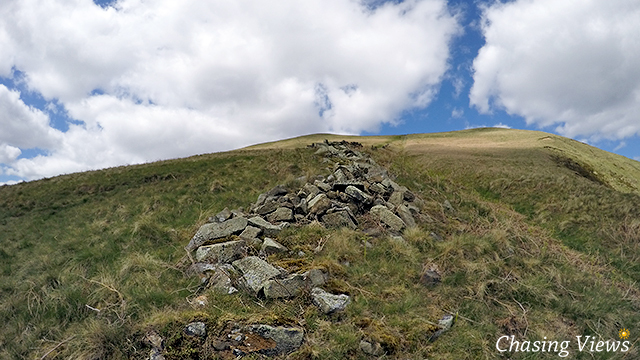 As I climbed up the steep mound, walking parallel to the dilapidated stone wall, it was becoming a real slog. 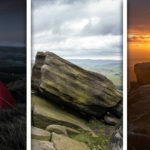 The excitement of wild camping on Kinder Scout, and the thought of capturing some fantastic photographs, kept me going. As I soldiered on, I eventually reached a point where I could see in the distance, a pile of huge rocks surrounded by mist. To the right of me was a dark green peak, standing proud with a backdrop of bright blue sky filled with fluffy clouds. As I continued my approach towards the huge rocks, I met a young couple who had already enjoyed their time on Kinder Scout plateau. After a brief conversation, it was clear that they had enjoyed it just as much as I was looking forward to it. After another half a mile or so, I finally reached the spot where I planned on setting up camp. Wow….. what a buzz and mixture of emotions. Relief after finally removing my back pack, but most of all, the mesmerising views which surrounded me. 360 degrees of fantastic scenery. I must have been standing there for 30 minutes or more just taking in the views. After having a good look around, it was time to get things sorted. I needed to find a suitable spot to pitch my tent, taking into account that the weather can change within minutes. I’ve spoken to a few people that have been wild camping on Kinder Scout who underestimated the changeable weather patterns. Time to pitch the tent! If you look at the following photo, this gives you an idea about how quick the weather pattern can change in the high parts of The Peak District. It was taken only 20 to 30 minutes after the image above. Tent is pitched! So the hard work is now done. My tent is pitched, kitted out, utensils at the ready. 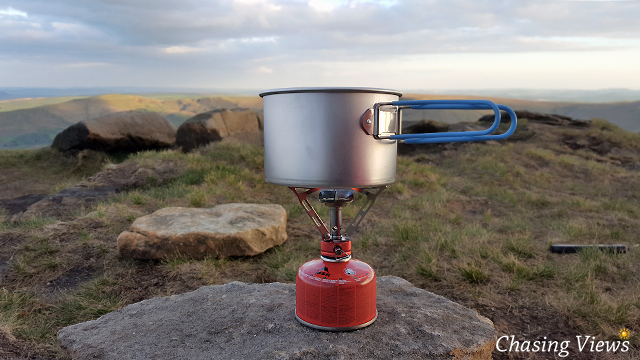 Time now for a nice fresh brew, something to eat and start enjoying my wild camping on Kinder Scout. Gas stove at the ready! After enjoying some nice food and a brew or two, it was time to zip up the tent and have a scout around the immediate area looking for good photography locations. 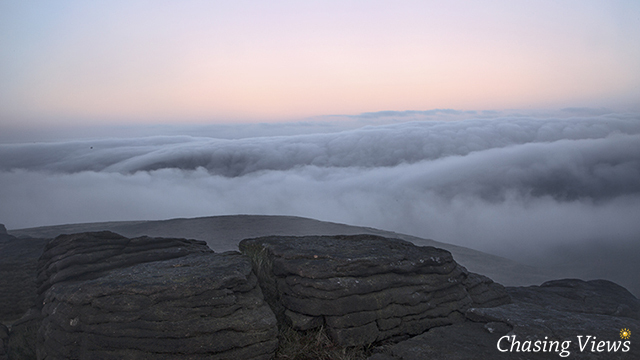 One of the main reasons why I decided to go wild camping on Kinder Scout was to hopefully wake up above the clouds and experience it with my own eyes. 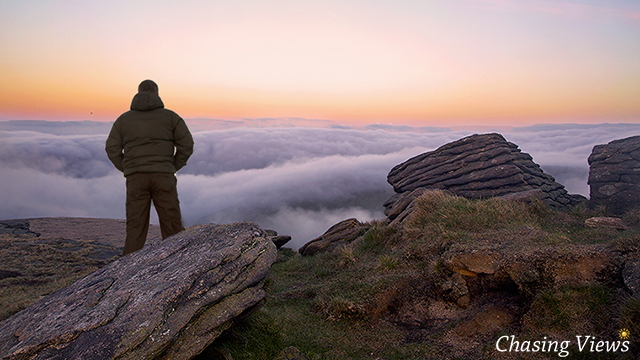 If I was lucky enough to capture a good shot of myself standing above the clouds, that alone would make this wild camp well worth while! After scouting around for a while, I did notice that the day was slowly drawing in. To my amazement, some cloud had just broken up, giving me a welcome glimpse of the sunset. Not something I expected after the earlier change in the weather. 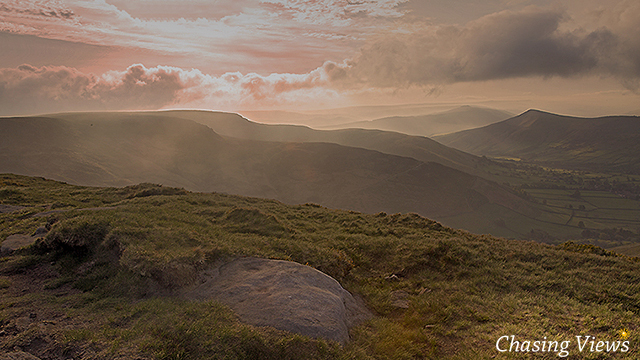 My mind was now set on trying to capture a shot of the sunset over Kinder Scout. Unfortunately, the cloud soon covered the sunset and reduced my view to a dark sky with very little worth capturing. Gutted! 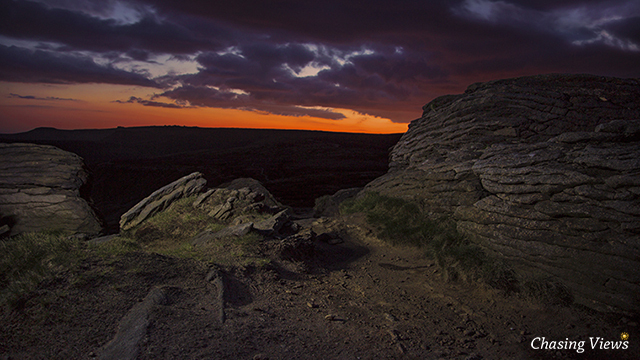 The main reason for wild camping on Kinder Scout was to capture what I could, in the best possible way. After pondering for a few minutes, I decided to boil up for another brew, then hit the sack ready for an early start at sunrise. Good Night! The next morning, I unzipped my tent, peeked out to see what welcomed me. I couldn’t see a thing, not even the stone I had used to balance my stove on, which was barely 10 feet away. It wasn’t looking good, but I got all my camera gear set up just in case. In the meantime I enjoyed a nice hot morning brew to warm the cockles. After about 20 minutes, things started to change. The cloud was thinning out and the sun started to peep through. I was so happy the weather had suddenly changed for the better. Although there was still mist lingering in the air, it turned out that the weather was on my side, giving me the chance to capture the following photographs from Kinder Scout. Myself standing above the clouds. What a feeling! The last photograph in this sequence was the money shot for me. It’s hard to describe the feeling I got while standing there literally above the clouds. The sense of space and freedom, mixed in with a feeling of accomplishment. Absolutely awesome!! Will I be doing it again? Most certainly! It’s been a great pleasure documenting my walk in The Peak District, and sharing the photographs taken on my wild camping on Kinder Scout. I hope you enjoyed reading it as much as I’ve enjoyed sharing it. If you have any questions that need answering, or wish to post a comment. Please do so in the comments box provided. I’m going to leave you with a final image that sums up the whole experience! i also would like to congratulate you on amazing pictures and sharing your experience i would if possible though some things have been touched on like to ask your advice on a couple of things any help would be gratefully accepted . Myself and my girlfriend last year climbed kinder scout for both of us it was our first major walk and climb though since we have walked the whole tissington trail and only have a few miles of the high peak to do from parsley hay we are both new to all this but the one thing we both agreed on is how amazing it would be to see the sun set and rise on kinder . With this we are at the end of july going to do this we have purchased camping equipment and both are very much looking forward to it .we though would like to ask your advice on a good place to camp on your photographs the view was stunning being first time campers we would like to know if there are places you could recommend i would like to set down near pyms chair the views into the valley are stunning there any advice ? . The other thing were concerned with are the stories of people wanting to camp being turfed off so to speak you say youve never encountered any problems but is it something that could happen just to prepare us i probably daftly believed we could camp anywhere but this doesnt seem to be the case . Although I am yet to wildcamp at Pyms Chair, I have walked past it many times. 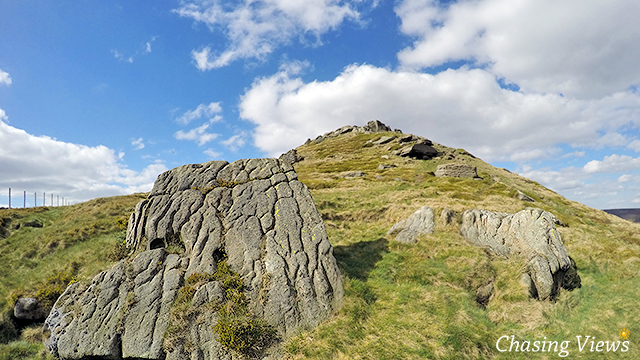 I think the views from Kinder Scout are spectacular from any angle. 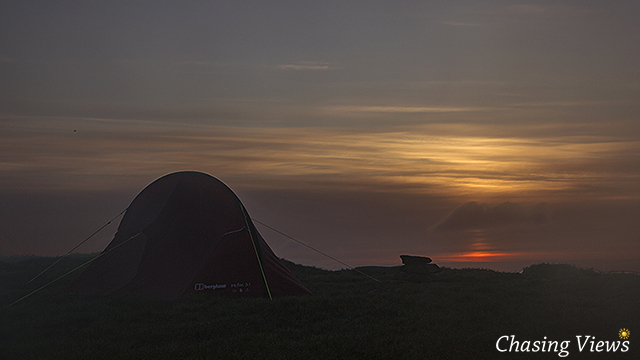 My favourite spot for wild camping is on Grindslow Knoll. I wouldn’t worry to much about being “turfed off”. I speak to lots of wildcampers, and hearing that people have been asked to pack up and leave is few and far between. Leave no trace, then most would agree that you are not posing any problem. I personally prefer to access Kinder from the Edale side, you can even grab a few pints in The Old Nags Head before you start. 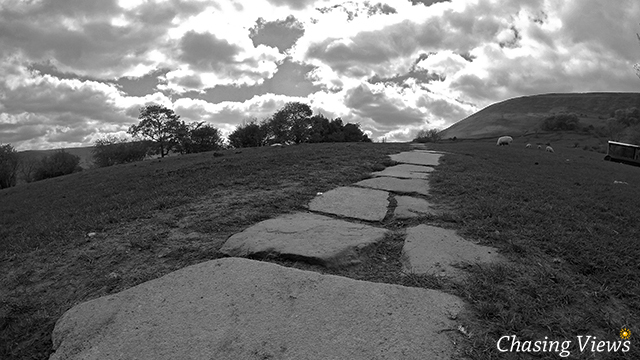 It depends on what type of walk you want, as some routes are harder than others. Again, thanks for your comment, and I hope it all goes to plan. Many thanks for your reply it has put our minds at rest we should be okay . The nags is our starting point nice meal and a couple of ciders when we did the walk last year we walked up Jacobs ladder that way personally I found it harder walking down it was quite steep in parts we have taken on board your recommendation of where to camp and we think it’s where we will pitch for the night . The Nags is a very good starting point!! As you mentioned, walking down steep hills, fells, and mountains can be as hard as walking up them. 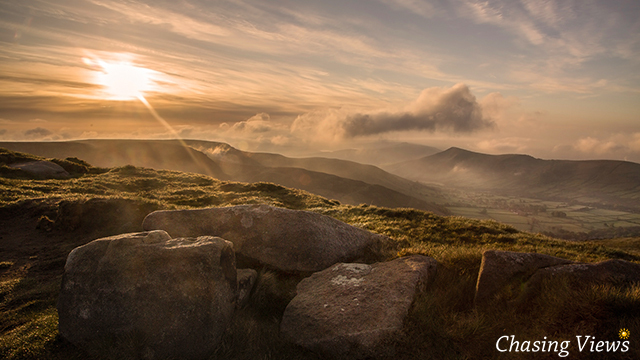 I’m sure you’ll enjoy a night on Grindslow Knoll. It’s a great spot with mesmerizing views. I hope your wild camp goes to plan. This is an inspirational article with some truly spectacular photography. Your words really brought your experience to life. I’m looking to do my very first wild camp this weekend and was intending to head up to the Lake Distruct..the only problem I’m finding is where to park overnight. I’ve also been considering the Peaks and going to Kinder via Edale too, but I keep getting warned about wardens and wild camping being strictly forbidden up there. Did you encounter any problems? Or are all the warnings just scaremongering in your opinion? And do you have any hints or tips? Thanks for your kind words Elliot. I can appreciate your concerns with regards to overnight parking. That is always a deciding factor for myself when choosing a location to wild camp. Although the majority of fells, hills, and mountains seem to have ample parking space somewhere in the vacinity. My main concern is the safety of my vehicle. I can only offer advice going from my own experience. I have never had an issue finding parking, nor have I had any security issues in the past. 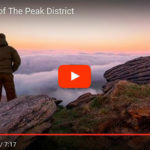 If you are considering wild camping up Kinder Scout. 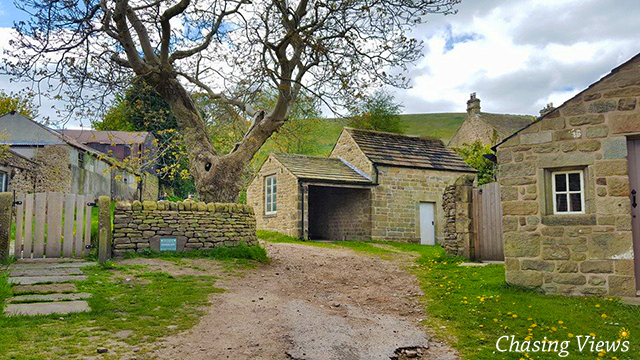 There is usually ample parking in the coach park on Edale road. (£5 overnight) There are also toilets in the car park, and a nice cafe just round the corner. I hope this helps. Hey Ash, thank you for your advice and thank you for checking out my website and commenting also. It’s always appreciated. Yes my concerns have also been centred around security. I’ve had some luck though in that I’ve spoken to a couple of campsites who are willing to let me leave my car in their car park while I go do my wild camping. Feels like a breakthrough and a good solution to my problem. It’s looking like I’ll be doing the Lake District this time, but then I’m going to come back and do Kinder second. Your article has certainly inspired me to visit Kinder. Oh by the way, do you have a newsletter/mailing list? I’d love to keep up to date with your latest works. Thanks again for your comment Elliot. I’ve just realised that I didn’t answer your question with regards to wardens and wild camping. I personally have never encountered any problems with wardens. In fact I have never seen a warden on my travels in the Peak District. I am fully aware of the rules and regulations with regards to wild camping, although I take every measure to ensure that I leave no trace. Glad to read that you have secured a good spot to park your car! I do not create newsletters, or have a mailing list, but I do plan on adding a box for my visitors to get informed when I post any new articles. In fact I will add the box at some point today. I will be wild camping on Kinder Scout this Friday night 26/05/2017, so over the next week or so I’m hoping to post a new article which will include a video and photographs. Again, I appreciate your positive feedback. I Hope you get good weather in the Lake District, and all goes to plan. After looking at some of these photographs. I can only echo what has already been posted. Amazing photos and a good read. The photo of you looking at the clouds is amazing. It has inspired me to want to do go wild camping on Kinder Scout. 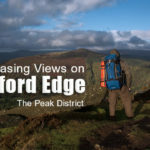 A group of us are heading for the summit of Kinder Scout at the beginning of June. 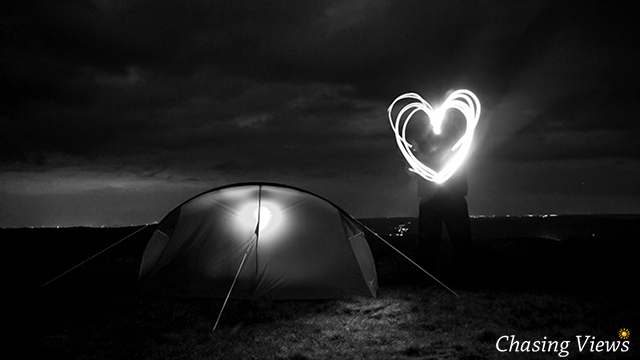 After reading your blog and seeing your beautiful photos, may I ask what route you took to the spot where you camped? Thanks for sharing this fabulous and informative article. I have gained a valuable piece of information from this. Myself and my husband also like to go walking in the Peak District. Stunning photos too! Wow, great read and great pics. Thanks for sharing! !